A great hip opening stretch that requires flexibility, strength and stamina, Garland pose, malasana, is a great posture for any level yogi. Take your time getting into this pose, paying attention to how your body feels as you work through the movements. Standing along the long edge of the mat, turn the toes to face the corners of the mat and spread the feet greater than hip distance apart. With a long spine and the abdominals pulled in, begin to bend the knees, keeping the heels planted. Stop when you start to feel the heels lift off the ground. The hips might sink lower than the knees or they might not, depending on your flexibility. Wherever the hips are, hold that pose. With each inhale, lengthen the spine and lift the chest. With each exhale, sink the hips lower. To deepen the pose, focus on shifting the weight to the outside edges of the feet and to the outer hips. You may also want to bring your hands into Namaste, at heart center, and bringing the elbows to the inside of the knees. Malasana can be a very grounding and calming pose, so try it with eyes closed, focusing on the breath, to see where any tightness occurs. When you notice that tightness, breathe into that spot. Malasana works to open the hips, groin and lower back. It builds strength in the lower legs, outer hips and feet. It can also improve balance and focus as well as enhance calmness and relaxation. Internally, malasana can aid digestion and activate the metabolism. Modify this pose as necessary based on your abilities and progress. If the hips do not lower past the knees and you want to focus on lifting the chest and relaxing into this pose, place a bolster or one or two blocks right under the sits bones. Keeping most of your weight in your feet, allow the bolster or blocks to lend support in this pose. If the heels can't help but lift from the ground, place rolled towels or wedges under them to give them necessary support. Sitting on the edge of a chair, spread the legs so the knees are wider than the chair, feet turned out. Inhale and lengthen the spine. Exhale and hinge from the hip, reaching the chest forward, perhaps bringing the torso between the knees, hands at Namaste. To add a spinal twist, keep the hips straight and bring the left hand to the inside of the left knee. On an inhale, begin to stretch the right arm skyward until you feel the hips shift. Then, back out a bit and focus on keeping the hips straight, while twisting from the middle back, chest and shoulder. Switch sides. If you have knee or ankle injuries, be very mindful about getting in and out of this pose. A lot of pressure can be transferred into the joints if not well supported by the musculature in the body. Those with tight hips will make this pose more challenging, but that is an even better reason to practice malasana. Use props to aid support, and add the pose into a regular practice to eventually loosen the hips. If any lower-back pain arises during the pose, or if you have a history of lower-back pain, make sure to use the abdominals to support the lower back in malasana. Do so by bringing awareness into the navel center and pull the belly button in toward the spine. Work to pull the lower abdominals up and in, activating the pelvic floor and the deep transverse abdominal muscles. 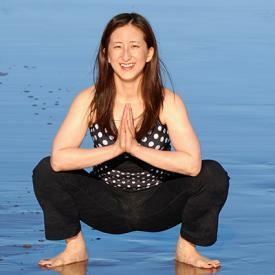 If there is sharp pain, release the pose and come into a resting pose, like child's pose. Because malasana is such a grounding pose and can really wake up the root chakra, remaining in the position for longer than other poses could help to stimulate a feeling of peace and stillness or connectedness to the Earth. Like many other asanas, malasana can be very subtle. Take the time to breathe through the pose and allow the body to reap its benefits.